Arizona is a state with a strong and diverse Indian population with a history that goes back over a thousand years. Along the East Coast of The United States, the newcomers from Europe arrived from the east in the early 1600’s. In Arizona, Marcos deNiza along with Estevanico (an escaped African slave), arrived in the current United States in 1539, a half century before British Colonies started in the northeast. Most of the cultural history of The Southwest comes from the Spanish and Indian influence, yet, the British version of history is still primarily taught in the schools. Book knowledge and oral tradition are 2 different ways to understand history and often they clash, but in Prescott, Arizona public art has bridged the divide. In 2001, Elizabeth Newman, wanted to give voice to the Indian stories that have been forgotten through a mural. With a group of Mile High Middle School Students, she went door to door asking for old stories, researched at the local Sharlot Hall Museum and asked elders from the local Yavapai Tribe. This created a minor stir as there had been a bit of a divide between the tribe and the local city government, but it was the beginning of a beautiful healing. Elizabeth enlisted the help of her friend and professional artist, R. E. Wall to help with the project. The students research grew into learning not only the cultural history of the land, but also the natural history. The students were asked to sit by the creek alone each day and make journal entries about the thoughts and feelings that came to them when they silenced their minds under the trees. Eventually, pride and respect for the land grew and the students began picking up the trash along the creek, and noticing subtle things like the birds and animals that inhabited the area. All of these influences were then arranged into a beautiful piece of art by Elizabeth and R. E. Wall for the students to begin painting. After a greatly successful project and a beautiful new piece of public art in this sleepy town, R.E. 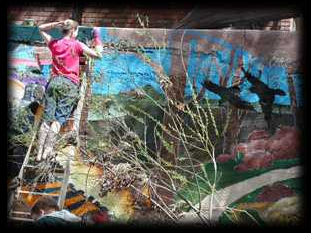 Wall took his inspiration for murals and formed The Prescott Downtown Mural Project. You may have heard about it a few years back when it sparked an national controversy and received lots of mainstream press during the SB 1070 battle. If not, you will have to stay tuned to learn more in this ongoing series about the power of public art and the power of educators, youth and a whole community to come together to give voice to history and bring healing. 12 years later, and still with much controversy about education in Arizona, and what history is allowed to be taught in Arizona schools, this mural sits quietly along the creek with a story to tell.